Justice League #1 | Hey Adults! Comics! Wow, what a disappointment for the first issue of the first comic in the reboot. 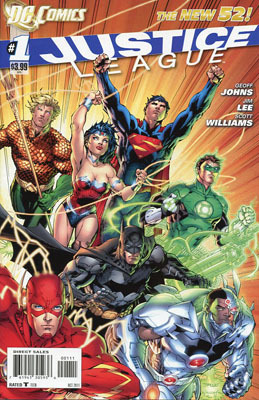 Though the whole team is on the cover, only Batman, Green Lantern and Superman are in the issue, Superman in all of 2 panels. Wonder Woman’s on the cover and I really hate her new costume. It belongs on an Image character from the 90s. Most of the issue is taken up with interactions between Hal and Bruce as they meet for the first time in this new universe. They encounter Superman at the end and the main thing I got out of the supposed character development is that they’re all jerks. Not only that, they’re essentially all the same jerk. The biggest difference is that Hal seems to be very stupid. The moment makes no sense! There’s no other way to interpret what Batman was doing. He was looking for a fight yet Green Lantern is so dumb he manages to convince himself that’s not what was happening. Is Hal meant to be a moron? There are two other main plot points in this issue, two other things they want to establish. In this world, it seems to be the very beginning of the superhero era and the world hates superheroes. Why they decided they needed to be a world of Marvel Mutants is beyond me. The other thing is that had a throwaway creature meant to establish the existence of Darkseid. Both of which are small things in the issue, but are big setups for later. The last thing in the issue is the encounter with Superman. GL forcibly restrains Batman while GL goes into a damaged building to confront Superman, saying “I can handle this”. Superman, with no other interaction, punches GL into another building and says “I don’t handle easy”. NOT a Superman reaction. Again, he’s just a jerk. Oh, and I almost forgot this because it was so forgettable. Vic Stone is introduced as a pre-Cyborg young athlete. They set his origin up, but that’s it. In an origin issue, it’d be fine. In this issue it disappears. I feel like Geoff Johns is suffering from Bendis syndrome. Both were really good writers when they started, but were given more and more responsibility and they turned into hacks. I’m hoping that isn’t what’s happening here, but it sure seems to be. Bendis recovered when he pulled back on his responsibilities, maybe Johns will too. This entry was posted in Uncategorized and tagged Batman, Cyborg, DC, Green Lantern, Hal Jordan, Justice League, Reboot, Superman, Wonder Woman. Bookmark the permalink. Pingback: Green Lantern #1 | Hey Adults! Comics!